Previously, this blog featured a lovely Edwardian lady who appeared to be preparing to puff a cigarette, a suggestive and shocking habit for a woman of the 1910s. This posts features her male companion, a dandy garbed in Edwardian elegance from his top hat to his slender shoes. He actually has a hole between his lips for a small novelty toy cigarette; I did dare to light it, but was unable to capture any of the resulting small smoke rings with my camera. There is also a hole through his left hand, suggesting that he once may have held a slender walking stick. 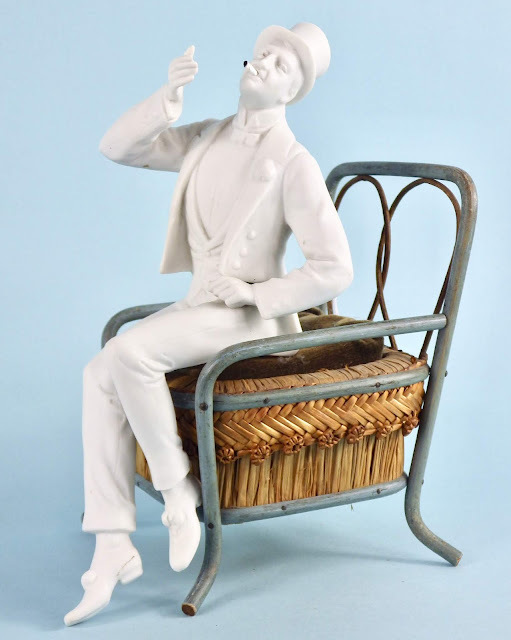 Like his female counterpart, this gentlemen is of sharp white bisque and is superbly modeled. He is 9 inches tall and unmarked. 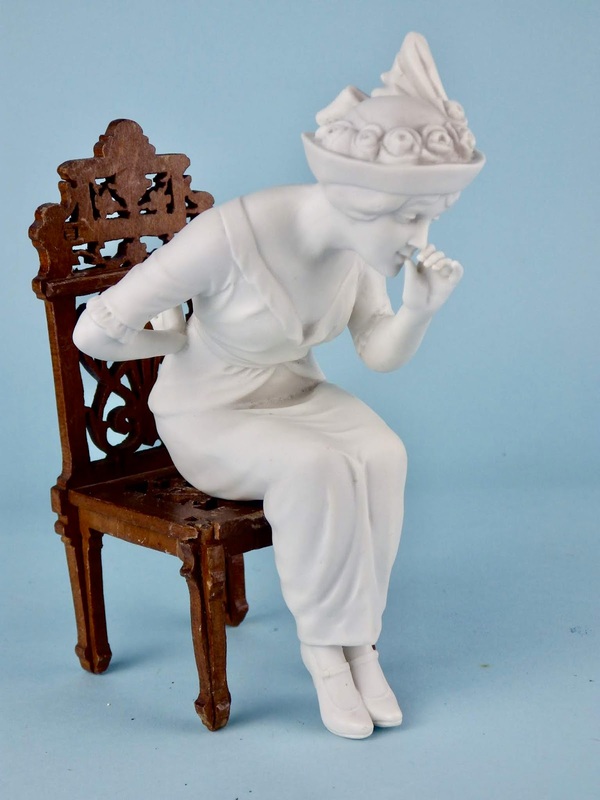 An identical figurine appeared in Theriault's 2001 auction of the archives of the former Hertwig and Company showroom. A close up of his handsome face demonstrates the fine molded details. Like painting one's face or showing one's ankles, smoking was something a proper Victorian woman would never consider doing, at least not in public. The image of a woman smoking, with all its Freudian suggestiveness, was sometimes exploited by the ribald or rebellious, but in the early 1900s, cigarette smoking by women was still largely taboo. During World War I, as many women moved into roles formerly reserved for men, from organizing relief to working in factories or offices, some also assumed male habits, such as lighting up an occasional cigarette. 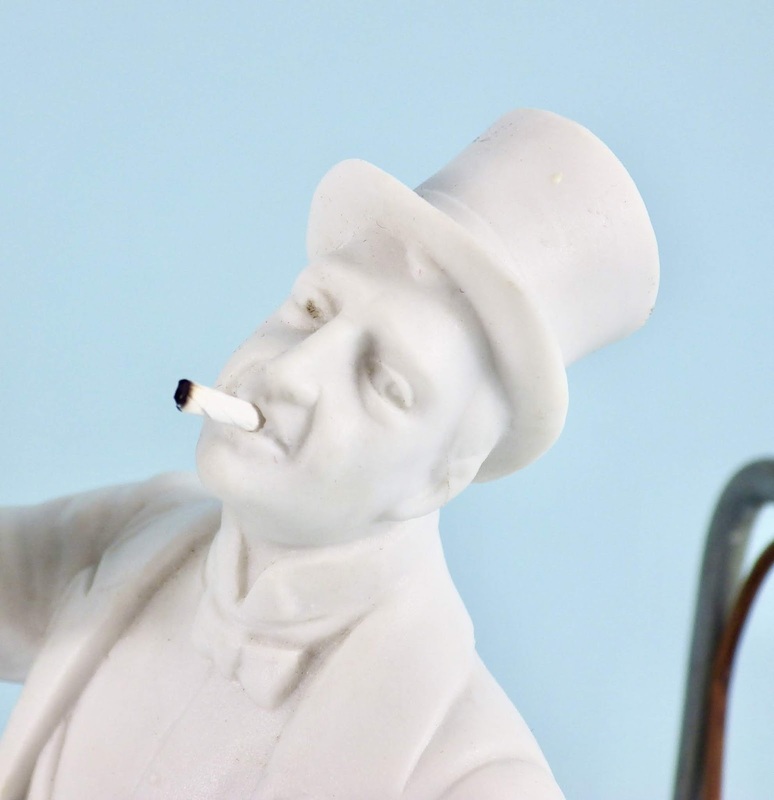 During the early 1920s, smoking was still seen as scandoulous, something those frivolous flappers did while slipping into speakeasies or engaging in petting parties. However, by the late 1920s that tobacco companies began to actively court female consumers. In 1928, the American Tobacco Company began its "Reach for a Lucky" campaign, seeking to persuade women that reaching for a Lucky Strike cigarette instead of a sweet would help maintain their "graceful, modern form." The following year, during the Easter Sunday parade in New York City, public relations executive Edward Bernays staged a small group of fashionable young women smoking their "torches of freedom" as they strolled along. 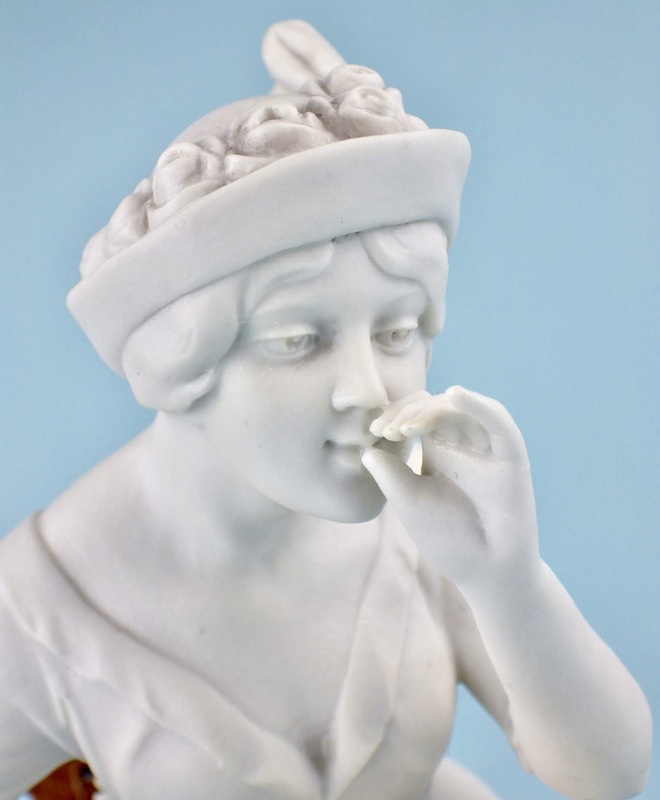 Still, when this fashionable bisque beauty was created in the late 1910s, a woman indulging in tobacco was considered more naughty than normal. Her charming chateau, rather understated when compared to the sweeping plumed and flowered hats of the earlier Edwardian years, and her form-fitting draped jacket with its peplum and ankle-length skirt suggest she dates from around 1917 through 1919. Her left hand is cupped in front of her face, as if holding an invisible cigarette, and she leans forward as if accepting a light. I wondered if she once might have held one of those miniature novelty cigarettes that when lit and blown out, continues to smolder and gives the impression of blowing smoke rings. I actually came upon a packet of these miniature smokes and while a cigarette did fit nicely in her hand, I was reluctant to light it out of concern that it might stain her delicate white fingers. 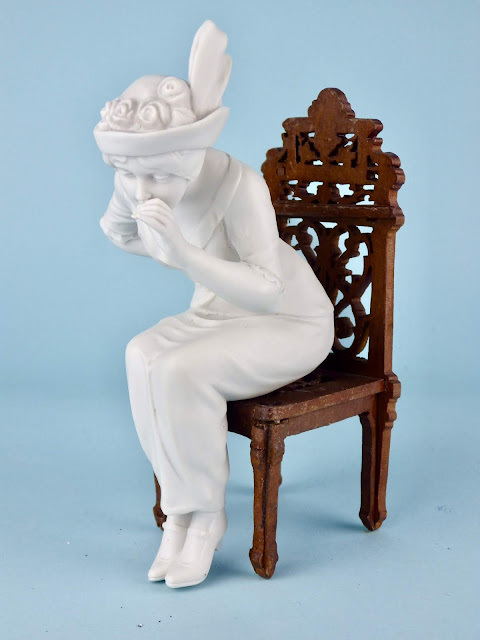 Of beautiful sharp bisque and superbly sculpted, she is 6.5 inches tall and incised under her seat "8194." In 2001, Theriault's held an auction of the archives of the former Hertwig and Company showroom, which included an identical figurine.